Discussion in 'UFC Discussion' started by liquidfire, Jan 3, 2013.
loss 1 was to rashad evens at LHW and it wasn't even bisping's real weight class. loss 4 was to chael sonnen, the closest any fighter has come to beating anderson silva in over a decade. bisping gonna kill belfort via more experience and skills. He also lost to The Hammer, if we go by reality, and not weird judging. Bisping is one of the most unproven fighters in the UFC, that somehow is always brought up in title shot contention. Yea they both seem like guys who can't quite get it done against the very best. He sorta lost to Hamill which is sorta the champ cause he sorta beat Jon Jones. People don't seem to remember that was really early Rashad Evans who wasn't that far removed from a draw with tito and a split decision win against Sam Hoger. Not anywhere near the same beast that Rashad has been the last 4 years or so. While Bisping is pretty much the same fighter. If they fought today Rashad would murderize him. Close doesn't count so doesn't this discredit your whole thread? 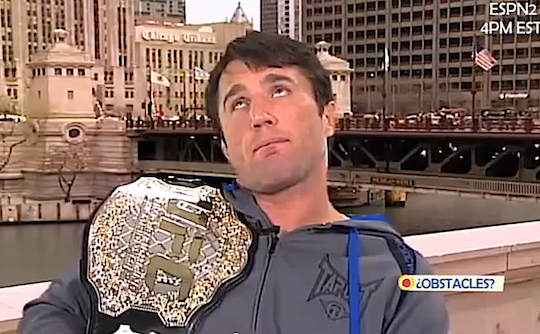 Chael was sorta the WEC MW champion. Vitor has a good chance to secure his first win against a top 10 fighter. War Vitor!! But does any division over 155 from WEC really matter? actually he lost to hammer via fantasy more accurate your fantasy world. cause in the reality that the rest of the world shared...he won. i hate when people make up nonsense. not saying i disagree with what you say about bisping, just your opening statement. Chael's not a champ, so no, you couldn't say the same thing. Lol at Bisping having more experience than Vitor though. Yep. Virtually all of his wins come from fighters that were underdogs and ranked lower than he was. Every single time he's had the opportunity to move up the ladder by fighting a legit contender, he's failed to come through. The only reason he's even talked about is not because of who he's beaten, but the fact that he's managed to have some closer than expected losses against highly ranked opponents. Even if Chael would have been able to last long enough in that fifth round to get that "win", it still wouldn't have counted as a win because he would have been busted for PED's and it would have probably been changed to a NC. So this argument isn't a good one because its just completely invalid. The same cannot be said for Bisping.